A common species throughout England, Wales and Scotland although there are only a few west country records and it appears to be largely absent from north west Scotland, the Western Isles with the exception of the area around Islay, Orkney and Shetland (NBN). Described by Balfour-Browne as a lowland species, they occur in all stagnant freshwater habitats; ponds, lake margins, fens and drainage ditches as well as peaty water and occasionally brackish pools. They are common across Watford although we have only ever found them in small numbers, generally in pairs or as single specimens and usually in company with other dytiscids e.g. 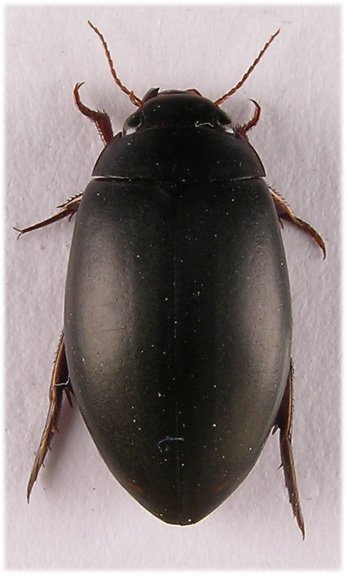 Ilybius fuliginosus or Agabus bipustulatus. Working the margins of dense vegetation in shallow water seems a productive way of recording the species. Adults are good fliers and may be taken at light (Jackson, 1973). A detailed account of oviposition as well as much interesting information regarding this species is given by Jackson (1960). In summary, eggs are laid within stems of aquatic plants such as Alisma, Juncus articulatus or J.communis and in the leaf stalks of waterlilies. The female is adapted for this in possessing (in common with other Ilybius spp. but absent from Agabus) a serrated ovipositor which she uses, usually facing down while clinging to a stem, to cut a V shaped opening into the stem tissue. An egg is deposited into this opening and cemented into place so that it becomes concealed by the flap of stem tissue, thus surrounded by air and moisture it is protected to some extent from predators and parasites. The 'scars' produced by this process are easily seen but for such a large insect surprisingly slender plant stems may be chosen for oviposition; Juncus leaves only 1.7mm in diameter were quoted. In the absence of suitable vegetation eggs may be deposited within leaf buds or axils of sphagnum or among filamentous algae. Incubation last for a month or so and larvae hatch facing the oviposition hole, the egg having been laid in the correct orientation by the mother. Egg laying takes place in late summer and autumn and first instar larvae occur from August, second and third instar larvae have been recorded in December. Adults hibernate out of water among damp moss etc. 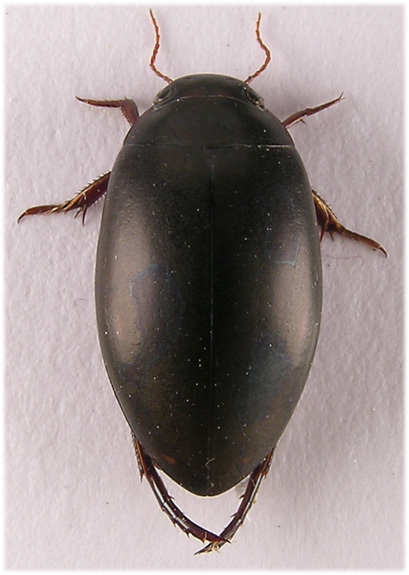 and are among the latest water beetles to emerge in the spring although Balfor-Browne quotes occasional specimens from mid-March. They occur throughout the summer and into the autumn but are rarely encountered later than early October. Soft freshly emerged adults have been found in June and July (Balfour-Browne). 13-15mm. With a little experience the large size, generally dull black colouration and convex form are characteristic. Some specimens have a faint bronze lustre. Entire upper surface distinctly microsculptured, this is irregular but generally quadrate and more deeply impressed in the female so that the surface appears a little more dull. Antennae and palps clear rufous. Margin of clypeus, labrum and two spots behind the eyes red. Eyes incised behind antennal insertions and distinctly convex. Clypeus with a transverse impression obliquely behind antennal insertions. Pronotum bordered laterally, front angles protruding and hind margin not, or only weakly, sinuate. With weak and random puncturation inside front and hind margin. Scutellum distinct, slightly transverse. Elytra with three rows of weak and randomly arranged punctures, these may be almost indistinct towards base. Sides and often a preapical spot rufous but due to convexity not visible from above, often indistinct, lateral margin with long, fine hairs which may be dense beside a preapical sinuation. Legs dark rufous. Basal segments of male pro and meso-tarsi with dense, long sucker hairs below. Hind femur with a series of short spines on undersurface inside hind margin near apex, easily seen from side. Metatarsal segments 1-4 lobed below, claws unequal, anterior shorter than posterior. Swimming hairs on upper surface of meso and metatibiae obvious. Jackson, D.J. 1973. 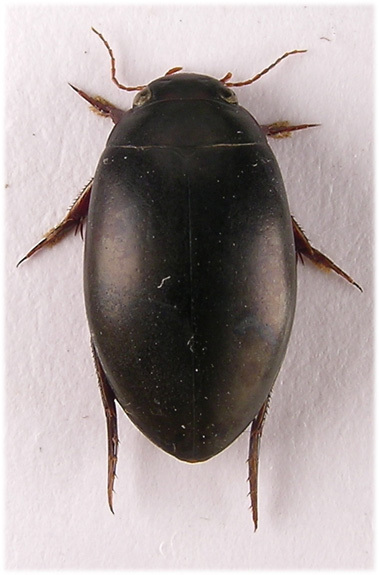 The influence of flight capacity on the distribution of aquatic coleoptera in Fife and Kinross. Ent.Gazette 24:247-293.